Move over Jet Skis, the MAC Attack 360 is coming through. You're in the driving position of a jet ski (PWC) yet with the stability and maneuverability of a boat. Then, when you're done zipping around or jumping waves, there's room for you and your mate to relax and even throw a fishing line over. It's just the perfect two person dive boat. It's the smartest design to hit the waves in years and can be legally driven in places where jet skis have had their day. With a 30hp motor it will even tow a skier or a wake boarder. 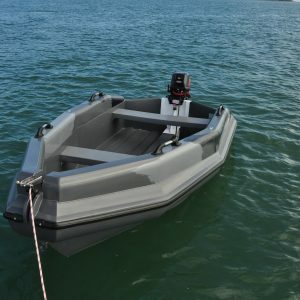 Take one for a run, it's a blast, with its unique design and versatility it's a must for a super-yacht tender. Move over Jet Skis, the MAC Attack 360 is coming through. You’re in the driving position of a jet ski (PWC) yet with the stability and maneuverability of a boat. Then, when you’re done zipping around or jumping waves, there’s room for you and your mate to relax and even throw a fishing line over. It’s just the perfect two person dive boat. It’s the smartest design to hit the waves in years and can be legally driven in places where jet skis have had their day. 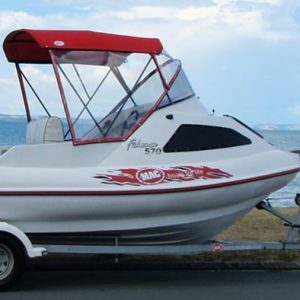 With a 30hp motor it will even tow a skier or a wake boarder. 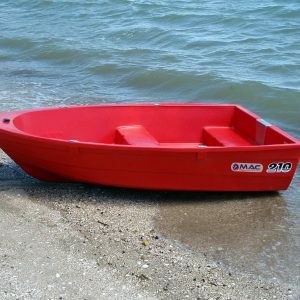 Take one for a run, it’s a blast, with its unique design and versatility it’s a must for a super-yacht tender. 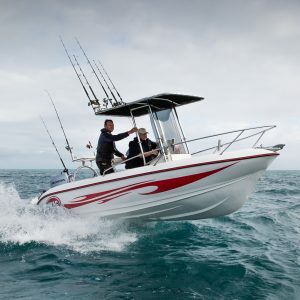 The soft riding quiet hull make for the best all round fishing/dive boat in its size.